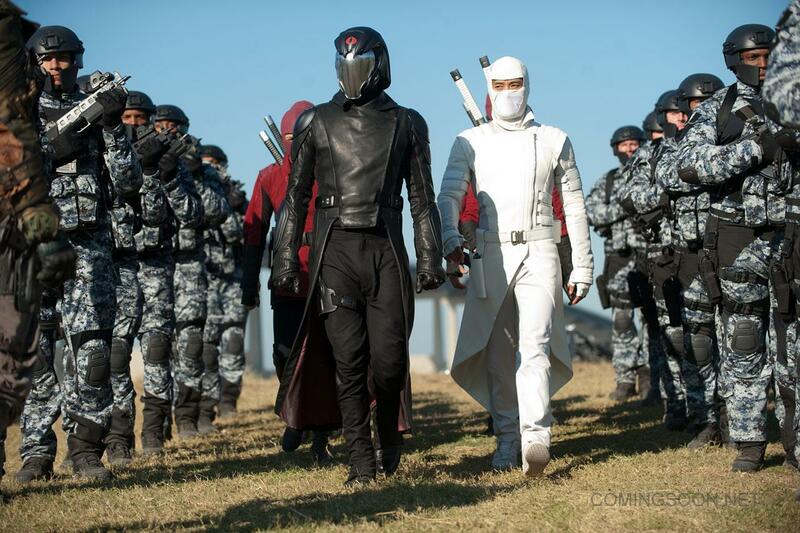 Finally, Cobra Commander looks cool. Essential plot rundown: The GI Joes must stop Cobra from conquering the world in this rebootish sequel. So this movie was suppose to come out about a year ago, but they decided to delay it to add more Magic Mike and 3D. Who would have thought that Channing Tatum would have become such a hot item between these two movies? So, the question on everyone's mind is: is this better than the first? Yes, yes it is. It is a completely different movie. The tone is a lot better; it is more actiony and less cartoony than its predecessor. It felt more like a GI Joes movie. The nature of the team itself has completely changed. Instead of a huge international organization with a silly underground headquarters, the Joes are portrayed as a covert group, more like the SEALS or something. There are only a handful of returning characters. 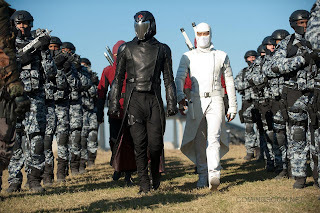 (Wait, Stormshadow is alive?) And the only real connection, story-wise, to the first is Cobra Commander is being held captive and Zartan is the president. Pretty much everything else has been wiped clean. 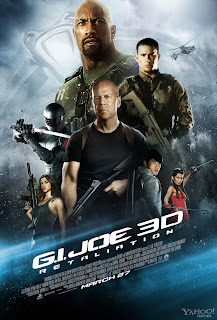 And while that sounds all good and dandy, GI Joes: Retaliation isn't perfect. (Surprising, I know). One thing that seemed odd to me was that Cobra had their logo on everything! Briefcases, motorcycles, satellites, pins, everywhere. It just seemed a little conspicuous, considering that Cobra is a terrorist organization. And there was too much ninja stuff going on. Snake-Eyes is out on his own, doing ninja stuff and everytime it would cut back to him, it took me out of the movie. All of those scenes didn't really mesh well with the rest of the movie. He should have just stayed with the Joes and those scenes scrapped. And they screwed up Stormshadow. They reveal some stuff about his backstory which weakens his character, doesn't add anything to the movie and, frankly, doesn't make any sense. So, that was lame. I also wanted more. The whole time I was thinking, I want more Bruce Willis. I want more Cobra Commander. I want more Firefly. I want more cool vehicles and stuff. I really enjoyed the movie, but it left me wanting more, and not in the good way. At the moment, I'm not excited for an another sequel; I just wanted more in this one. But, overall, it was a fun movie. There was some cool stuff and ideas. I really liked the scene where the president meets with the other world leaders. So, yea, check it out if you want.